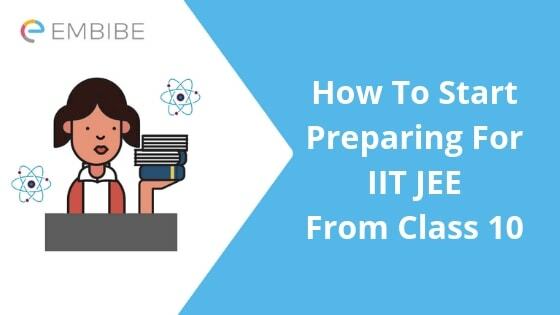 How To Start Preparing For IIT JEE From Class 10: Are you one of those students who like to prepare early for competitive exams? Well, good for you! The IIT JEE is one of the most popular competitive entrance exams in India. Every year, 11-12 lakhs of students register for the JEE with hopes and aspirations to get into the top engineering colleges in the country. The competition is pretty stiff too! Out of the lakhs of students who sit for the exam, only thousands of them qualify the exam. This is one of the reasons why most engineering aspirants prefer to start their JEE Main preparation early. And the 10th Class is just a good place as any to start! If you’re busy giving your 10th boards, it won’t be long before you start worrying about the IIT JEE and how to start preparing for IIT JEE from class 10. After all, the JEE syllabus is based on the 11th and 12th syllabus. But we’re here to tell you that you shouldn’t worry yourself too much. In this post, we will provide a 2-year study plan for JEE and tips on how to start preparing for once you are done with your board exams of Class 10. Let’s start with the Class 11 syllabus in Year 1 since you’ll be in the 11th standard in a few months. You should follow the year 2 plan as per the strategy shared below. But, it is advised for you that do not stop revising the last year study material. It will be helpful for you in staying into the practice. It is mandatory for you to make a proper plan which can really be effective for your preparations. A- First shortlist the important concepts to practice on them as the priority. B- Some concepts can frequently appear into the question papers of various years, make a note of the questions with high probability and practice them. C- Whenever you finish a concept, practice-related questions to memorize it properly. One tool that can help you to learn your concepts in a structured way is the Knowledge Tree on Embibe. RD Sharma would be ideal for Mathematics. Maths is a scoring subject and if you are referring to this book, you can easily score around 80% here! OP Tandon for Organic Chemistry and Physical chemistry, NCERT for Inorganic Chemistry are the best books from which sound chemistry concepts can be learned. According to the JEE Main exam pattern, the examination is conducted for two papers: Paper 1 for B.Tech / B.E candidates and Paper 2 for B.Arch / B.Planning candidates. Paper, I consist of a total of 90 Multiple Choice Questions of Physics, Chemistry, and Mathematics. Paper II contains a total of 82 questions- 30 questions from Mathematics, 50 questions from Aptitude test and 2 questions from Drawing test. Investing your time sensibly is the key to crack any entrance exam. It is necessary to be selective and rigid. Students need to find out the right kind of study materials and spend just the right amount of time practicing each topic. Not only are you required to follow an effective timetable, but also, make use of efficient time management in the entire process of preparation till writing the exam, which is a major deciding factor. You must include time management in your JEE Main preparation plan. As part of the JEE Main preparation, it is recommended that students adopt a proper exam strategy and follow it sincerely. A well-planned JEE Main preparation timetable and thorough browsing of the entire question paper is especially relevant. While attempting the questions, it is recommended that students are careful and do not waste time unnecessarily on questions that he/she is not sure about. Taking mock tests regularly to improve your overall exam taking strategy must be a part of your JEE Main preparation. Embibe’s RANKUP is India’s first personalized and score improvement tool. It provides personal mentoring and helps students overcome the challenges they face in scoring by showing where and how to improve. a) Keeps track of every movement you make on the website and pinpoints the key areas you are lagging behind. b) Keep track of the time spent by a student on every question and from these data, it helps the student to increase their speed and accuracy while taking a test. c) Gives personalized suggestions on how to improve your exam-taking strategy, time management skills, and question selection skills. d) Rates how much effort you are putting into your preparation. e) Helps you to build your stamina to sit for long hours to take a test without getting exhausted. We hope this detailed article on How To Start Preparing For IIT JEE From Class 10 helps you. If you have any queries regarding How To Start Preparing For IIT JEE From Class 10 or the exam in general, drop a query in the comment section below and we will get back to you at the earliest.